Eyes to the sky, Astronomy Ireland are expecting a celestial firework show this weekend. EARTH IS BEGINNING to make its way through a cloud of dust and debris left behind by Comet Swift-Tuttle, and already people all over Ireland have spotted bright Perseid meteors caused by this dust, Astronomy Ireland said yesterday. 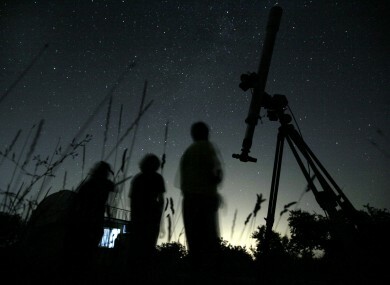 It is expected that on Saturday night, observers will get to see hundreds of meteors per hour. When debris enters Earth’s atmosphere it lights up in the sky as meteors – also known as shooting stars – and the Perseid Meteor Shower is one of the best of the year. Already, Astronomy Ireland has received several reports from around the country of people spotting bright meteors in the night sky. The best time to see the meteors will be after midnight on Saturday night and into Monday morning, but they can be seen at any time in the days before and after this peak once it’s dark. Perseid meteors can glow very brightly, and with no Moon to cause a glare they will be easily visible. In fact, they sometimes burn so brightly that they produce fireballs. The Perseid meteors will appear to originate from the constellation Perseus in the north-eastern sky, but can be seen anywhere in the sky. No telescopes or binoculars are needed to see the Perseids as they are bright enough to be seen with the naked eye. On Tuesday night I got to see four extremely bright meteors in less than half an hour. The Moon will be out of the way so it is definitely worth going outside to try to see some Perseids for what is already proving to be an excellent shower. Sometimes large pieces of debris enter the atmosphere and flare up extremely brightly as fireballs – these can often land on the ground. We want everyone to go outside every night over the next week and take part in our Nationwide Meteor Watch. For more information on the Perseid Meteor Shower and how to take part in the Nationwide Meteor Watch scientific research you can visit the Astronomy Ireland website. Email “Meteors to rain down on Earth over coming week”. Feedback on “Meteors to rain down on Earth over coming week”.